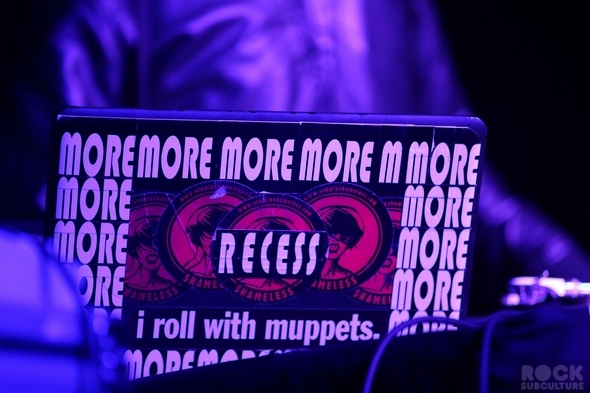 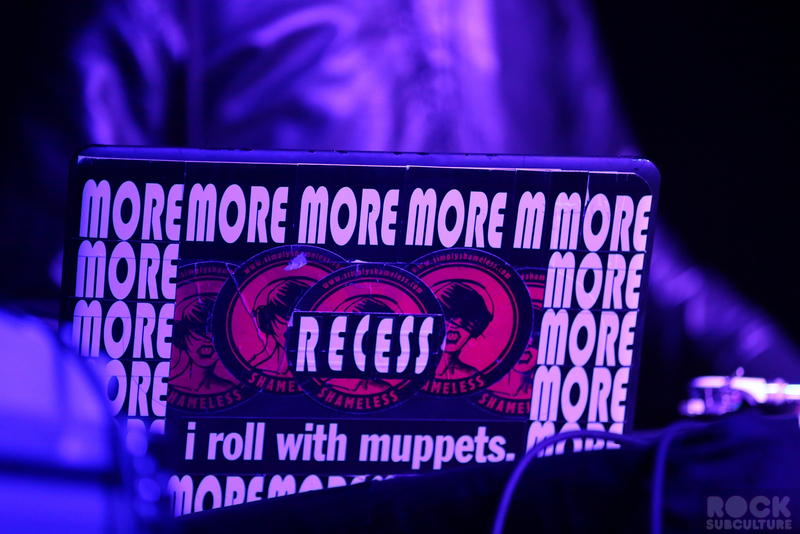 Recess is a Seattle DJ who has been active in the local music scene for decades. 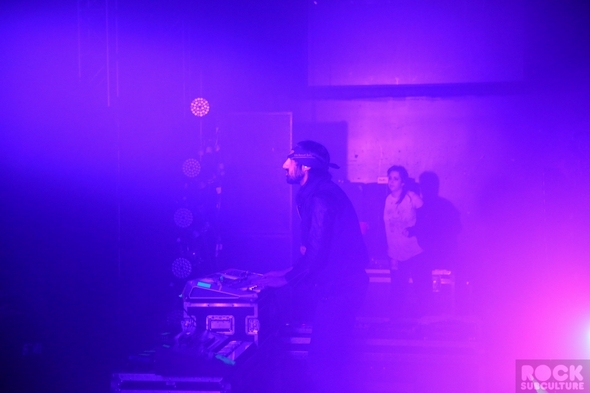 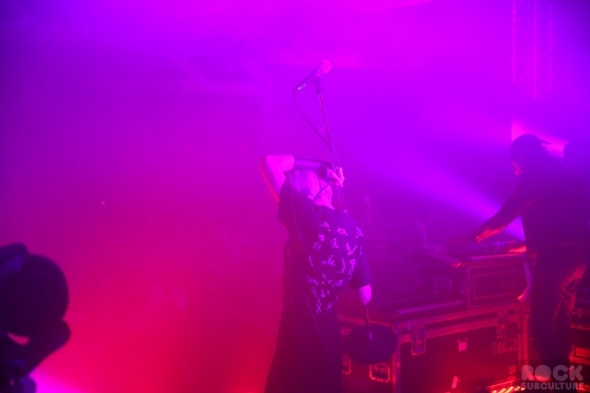 He put on an impressive opener with a really unique and polished set, managing to pull out deep bass sounds from a variety of tracks, and, rare these days, was mixing off vinyl. 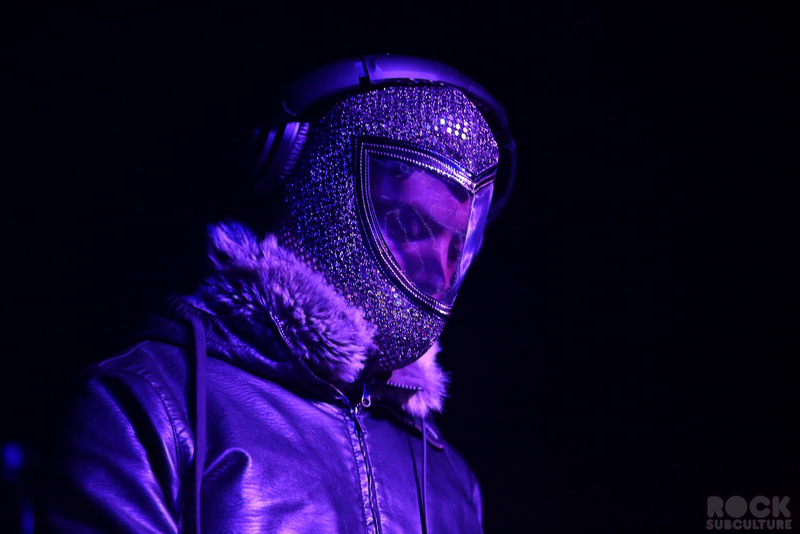 You can check out his sound from streaming mixes off of Soundcloud. 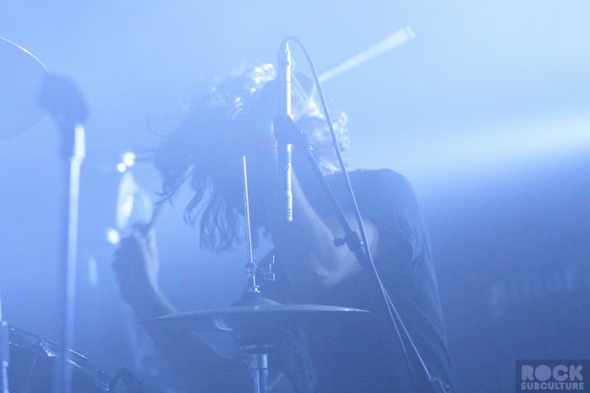 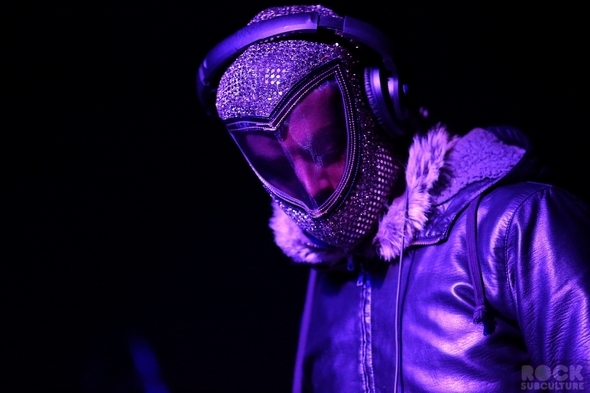 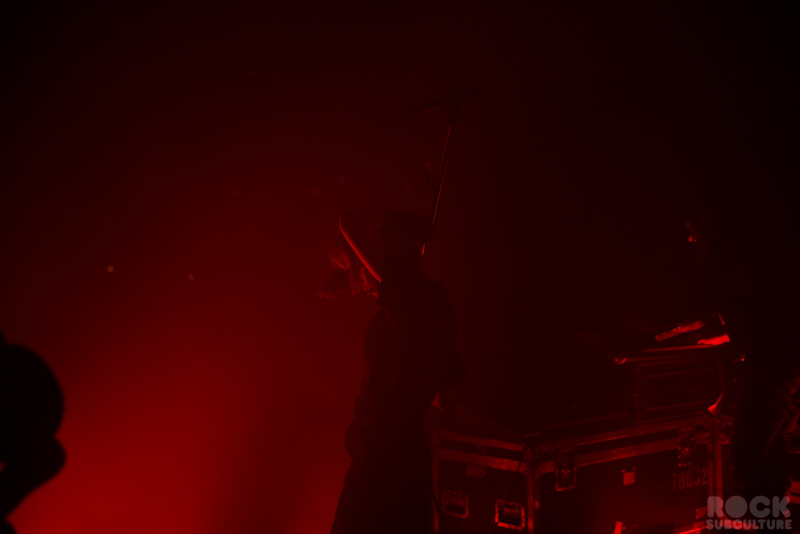 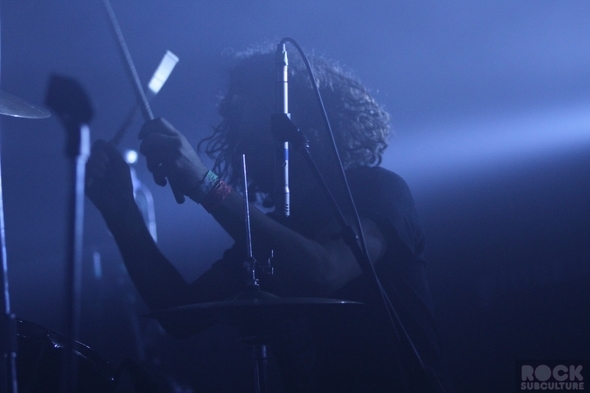 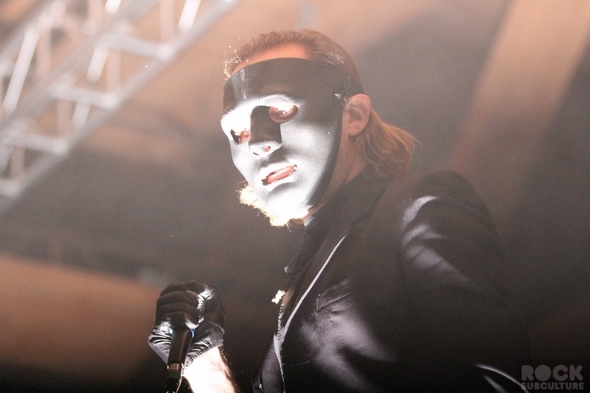 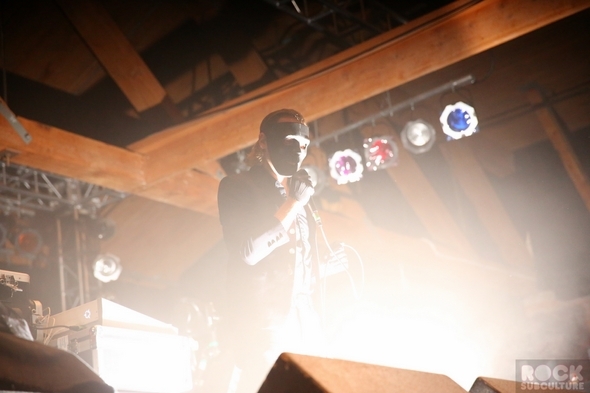 Kontravoid is Cameron Findlay, who was the drummer for headliner Crystal Castles from 2007-2008. 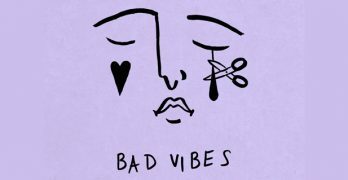 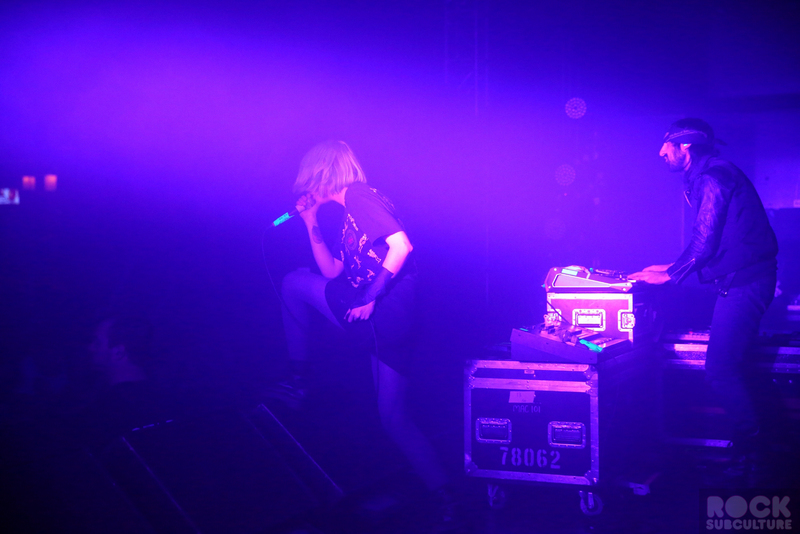 Bass heavy with samples and his own vocals, the electronic music reminds me a bit of the Industrial music of the late 80s/early 90s (like Front 242). 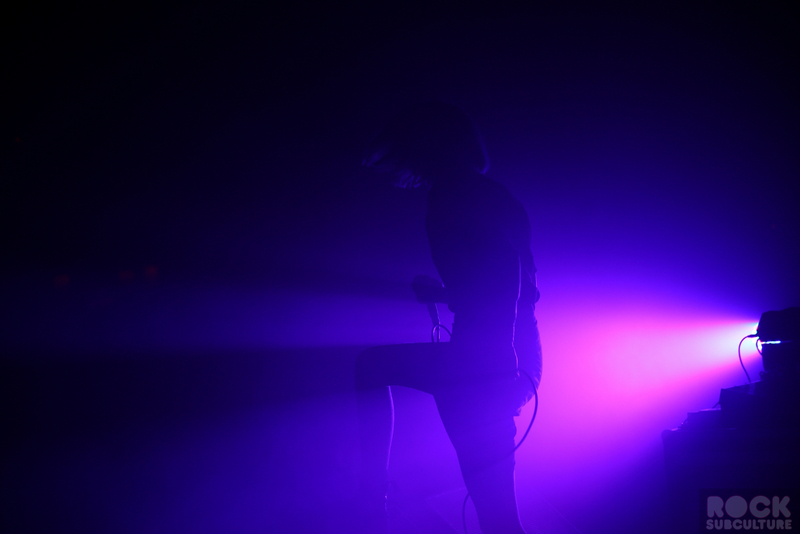 With intense strobe lighting, it was actually a challenge to even get a few photos… You can stream as well as purchase his eponymous album from Bandcamp. 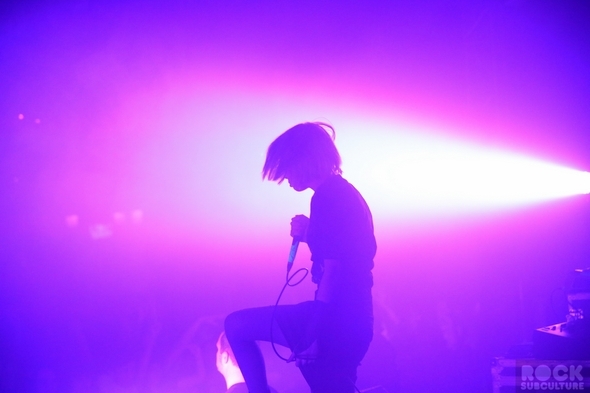 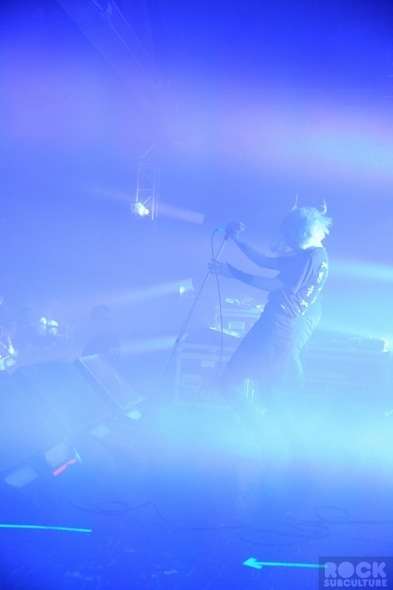 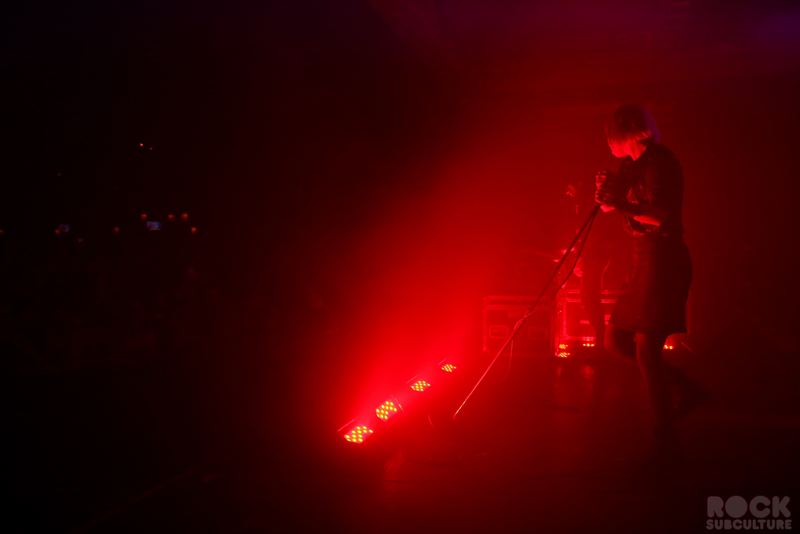 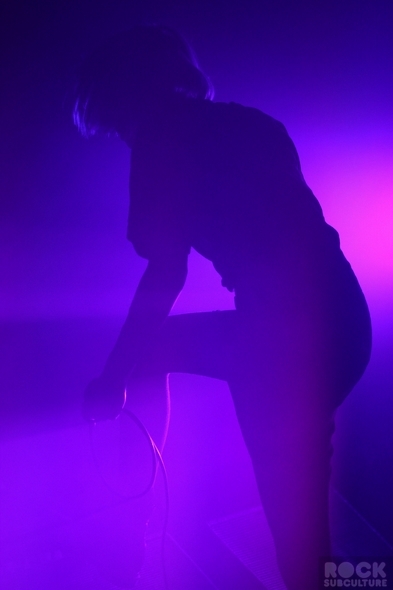 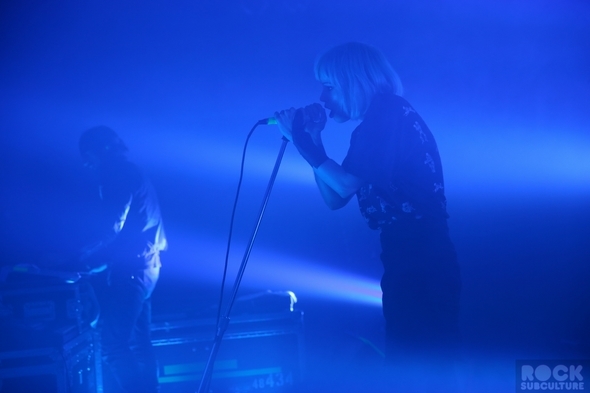 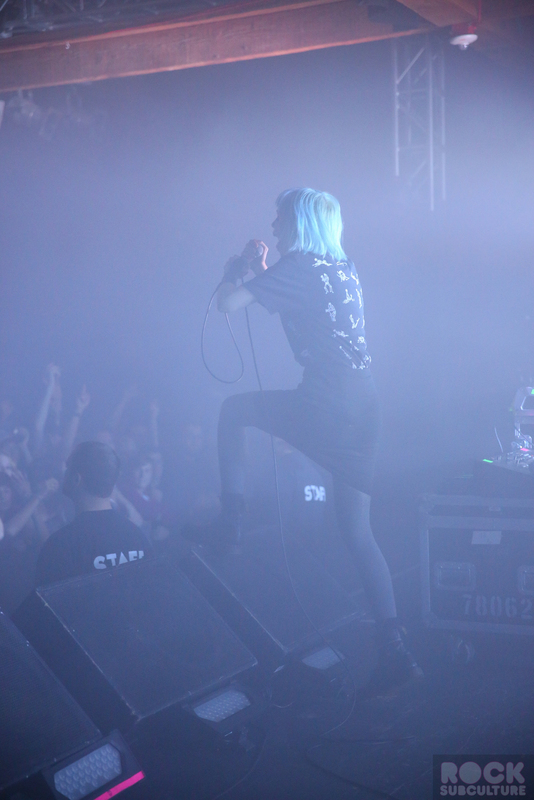 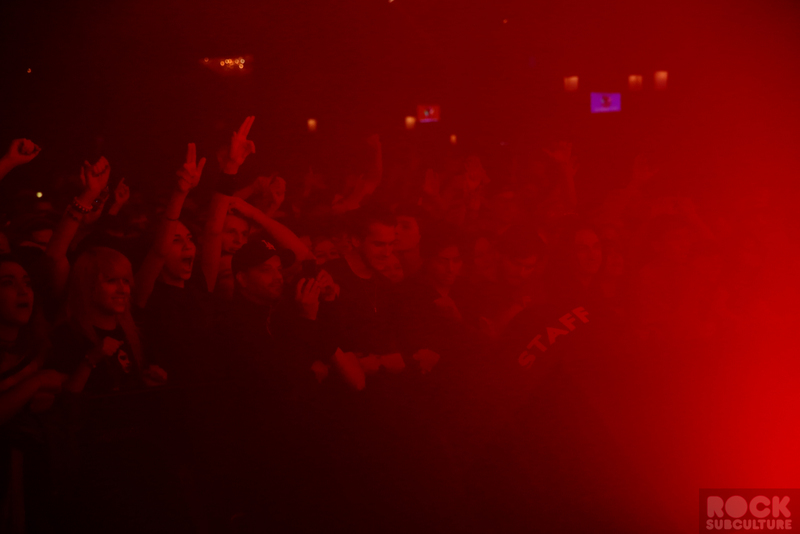 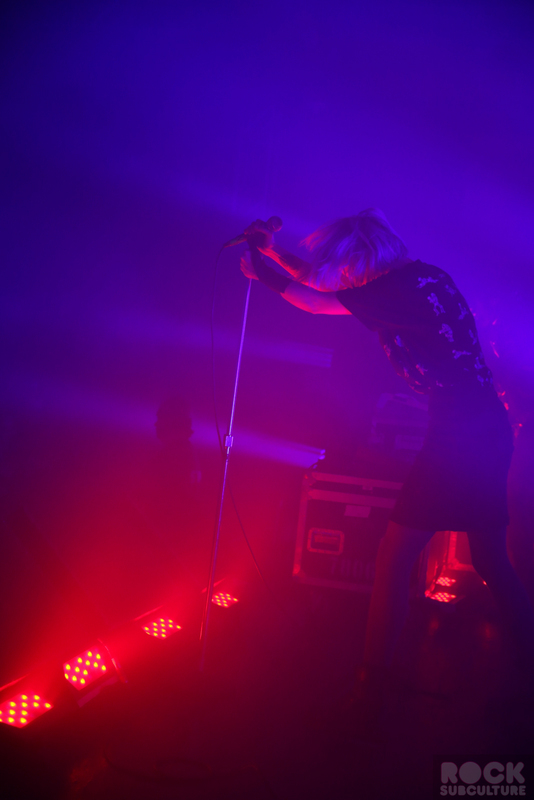 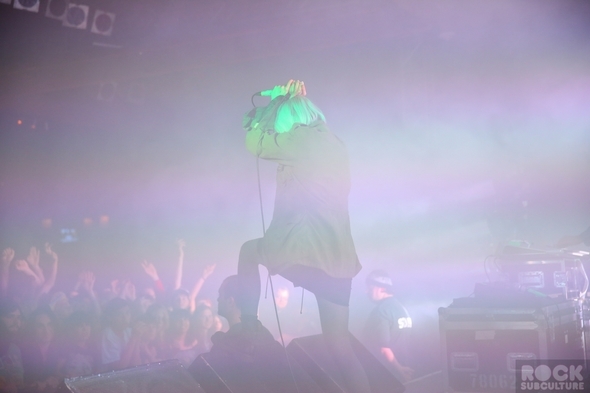 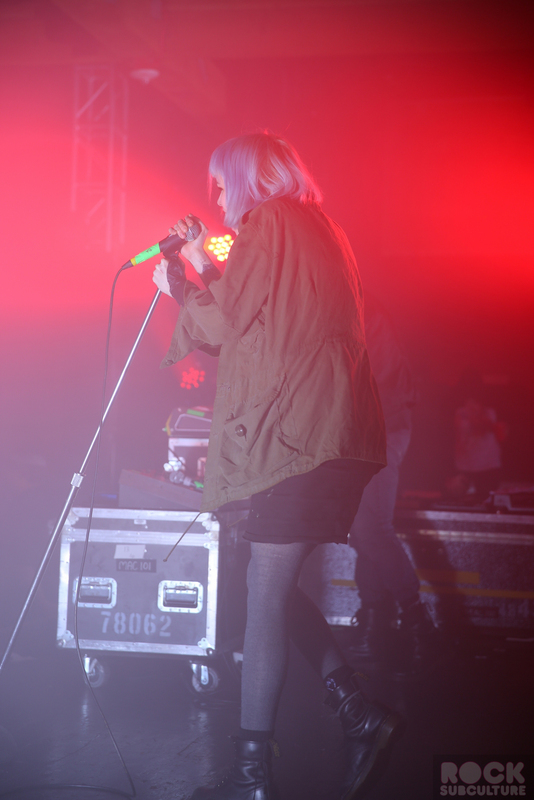 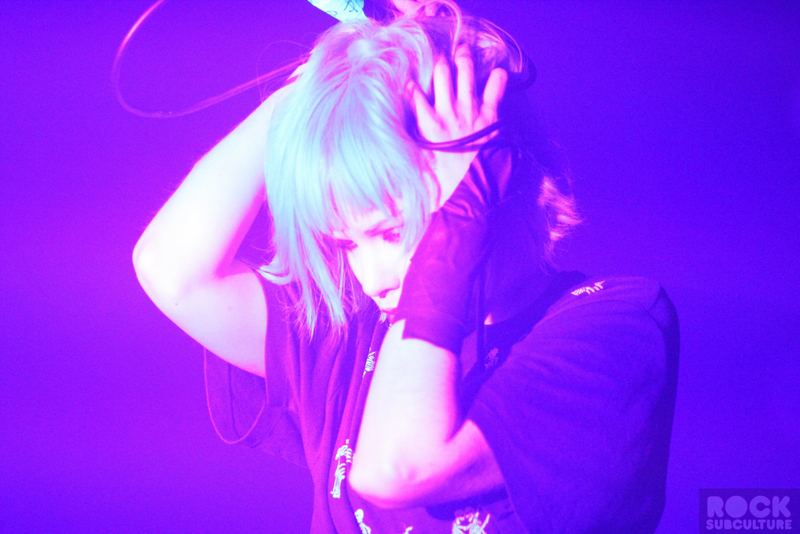 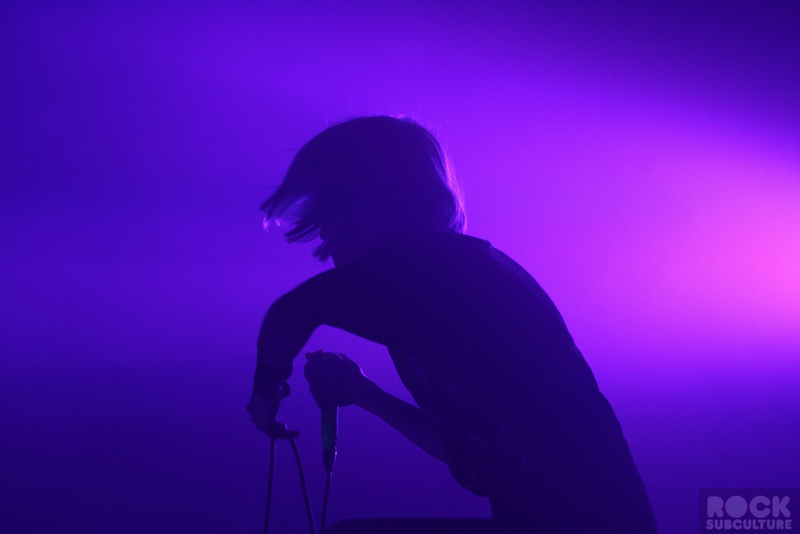 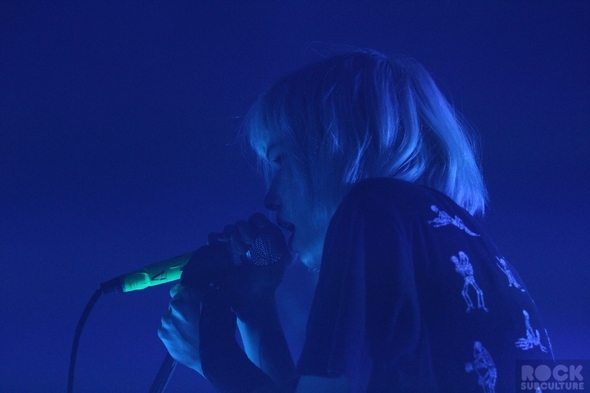 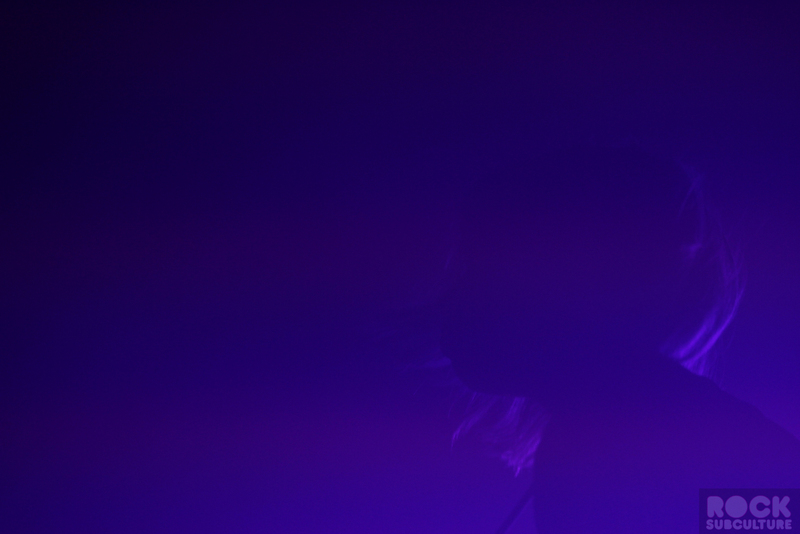 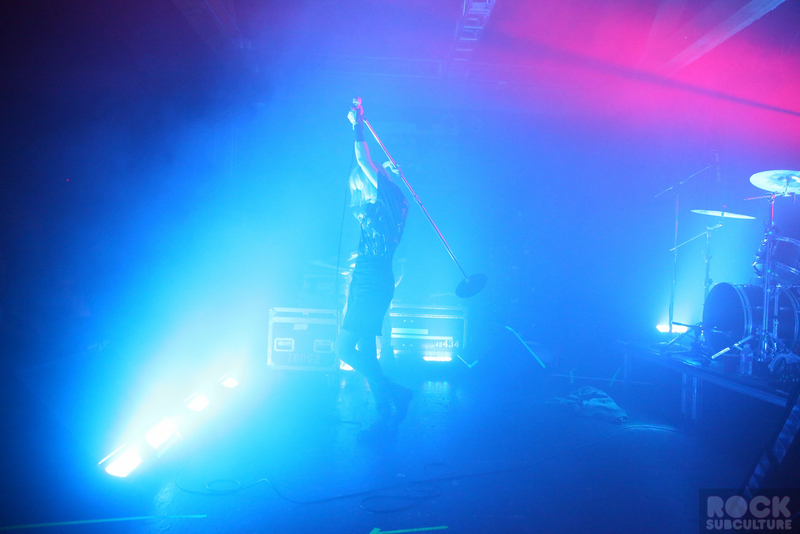 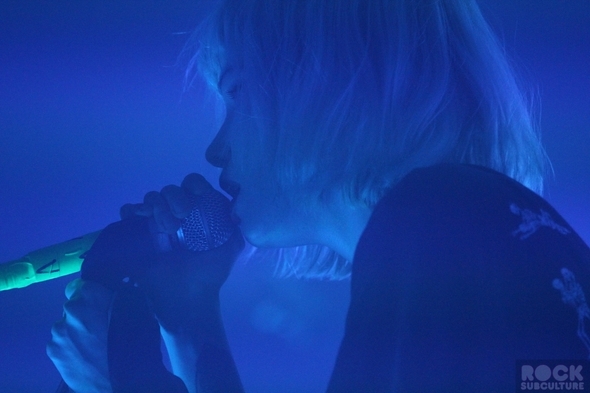 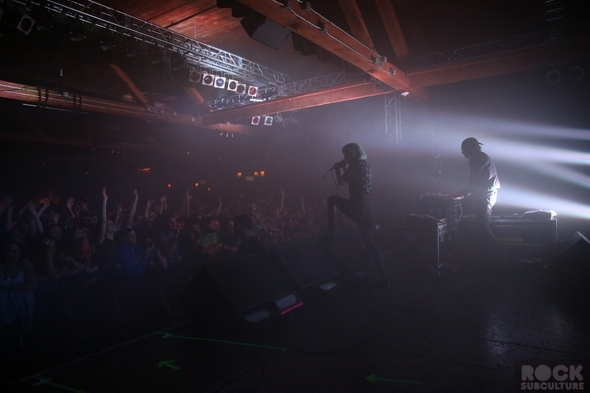 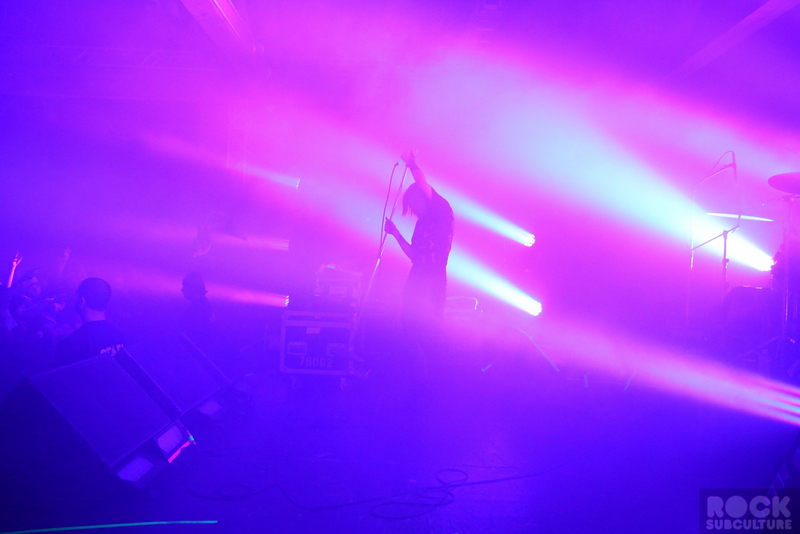 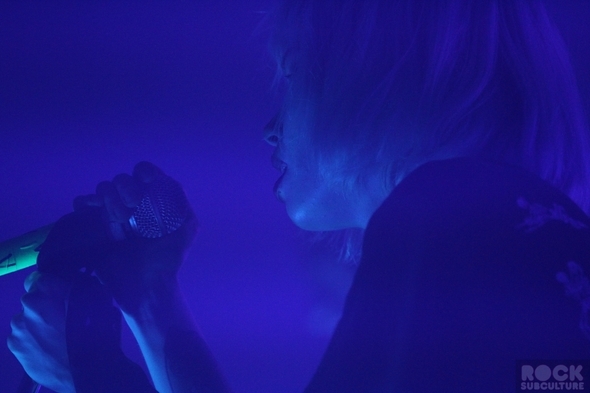 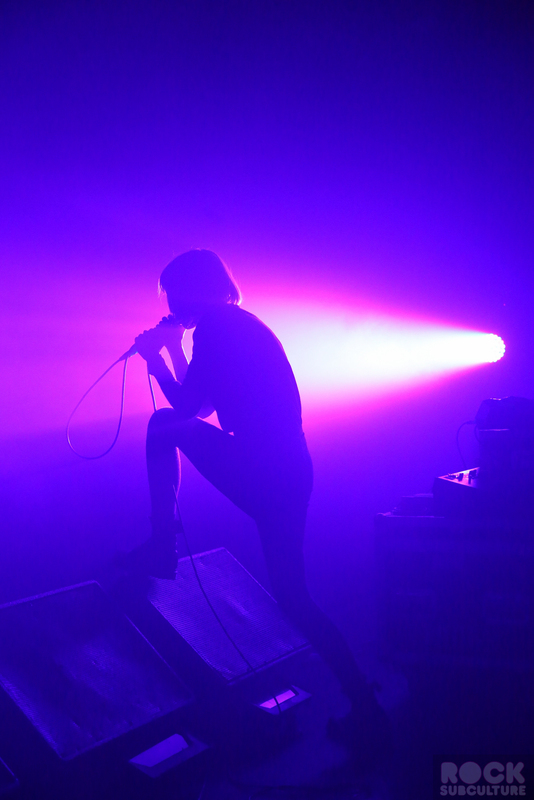 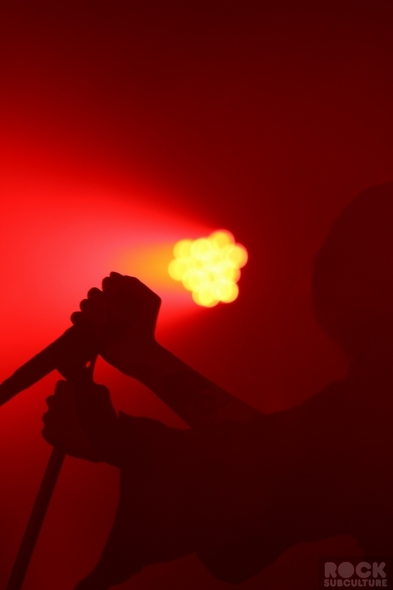 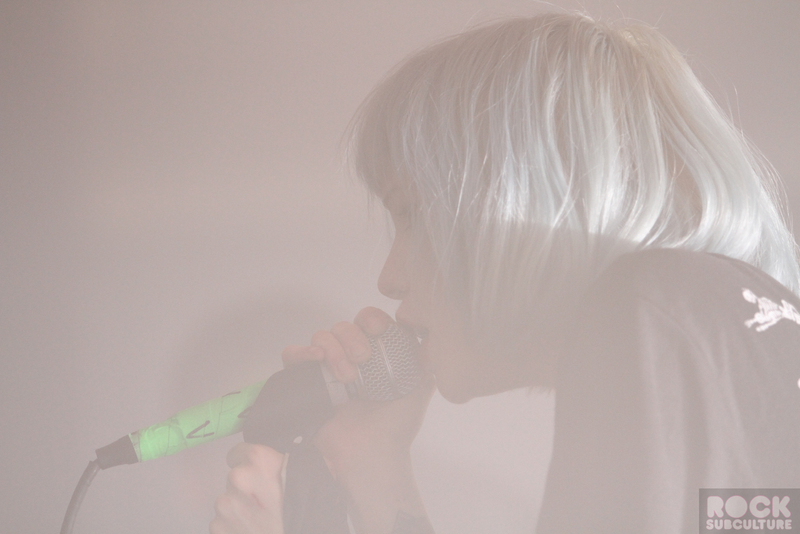 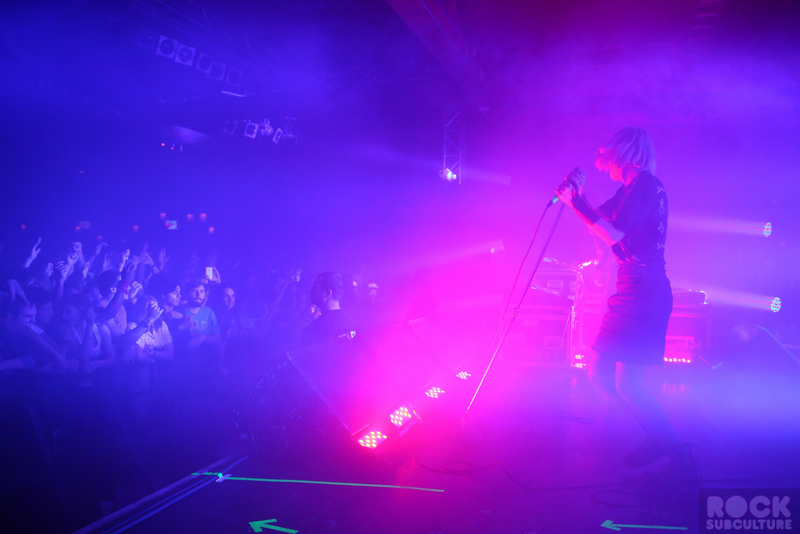 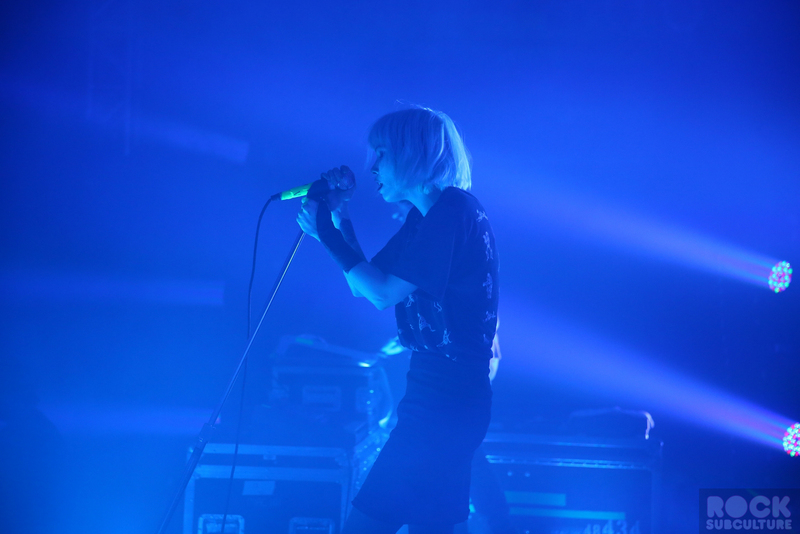 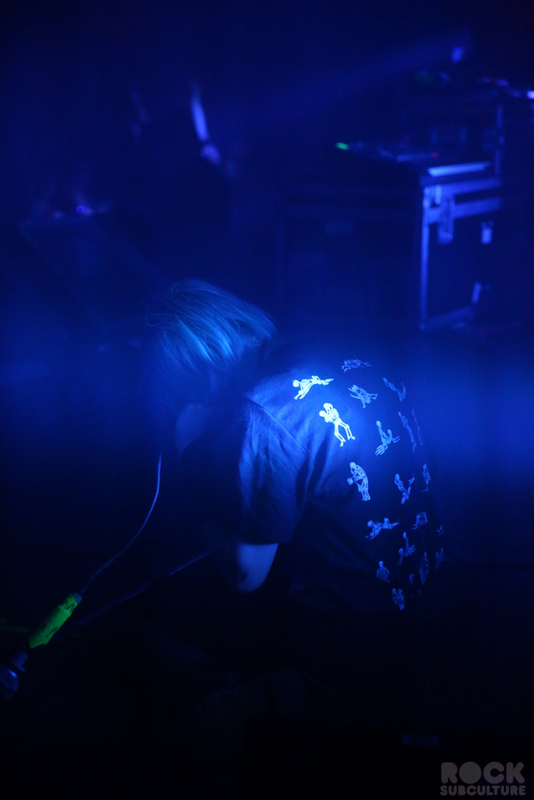 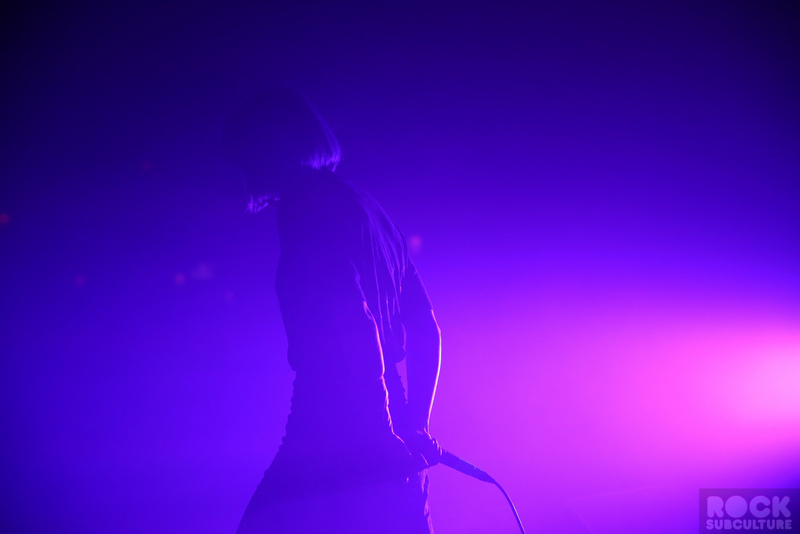 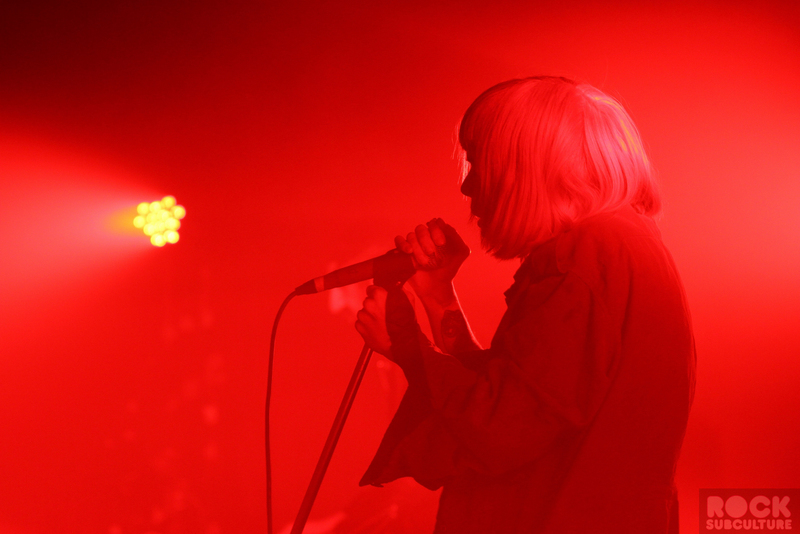 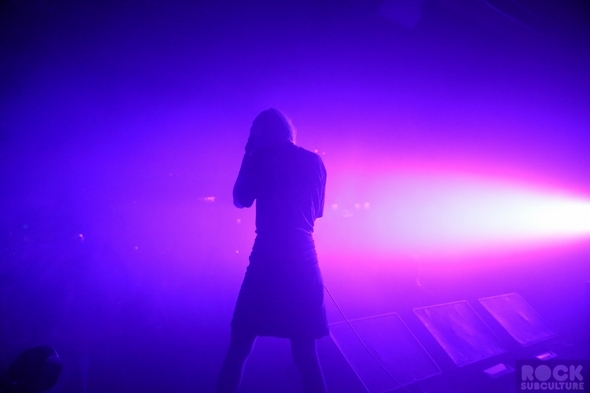 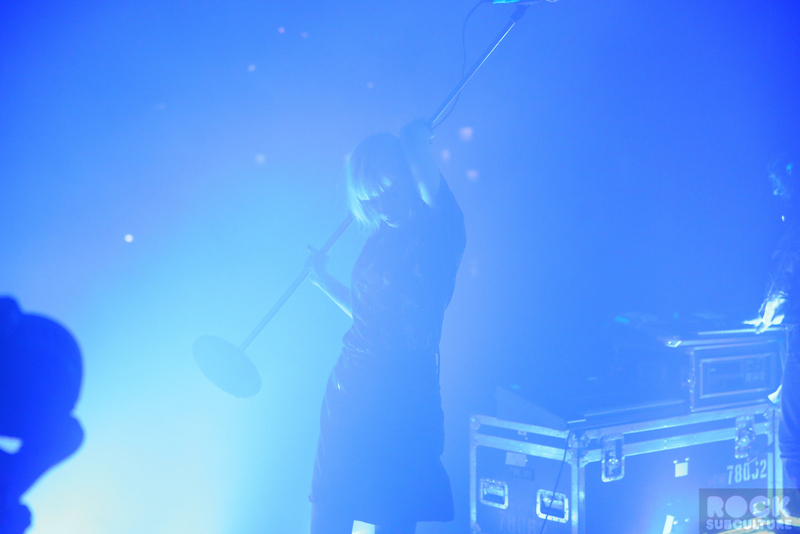 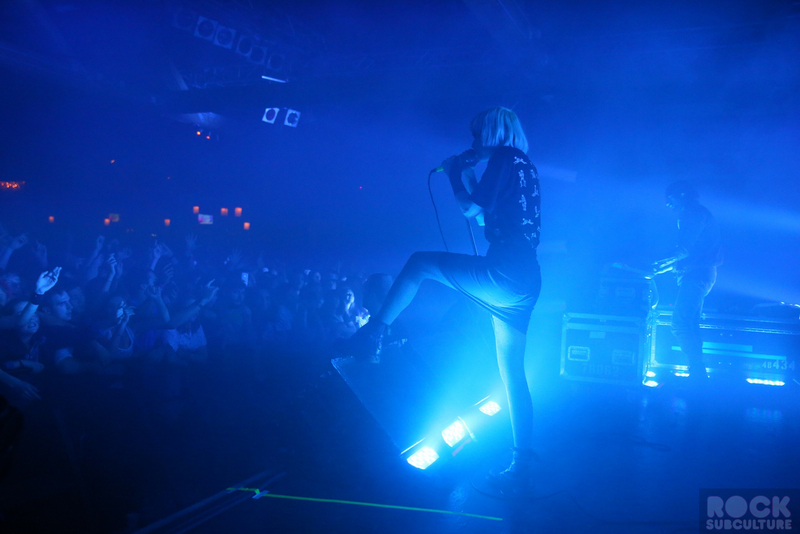 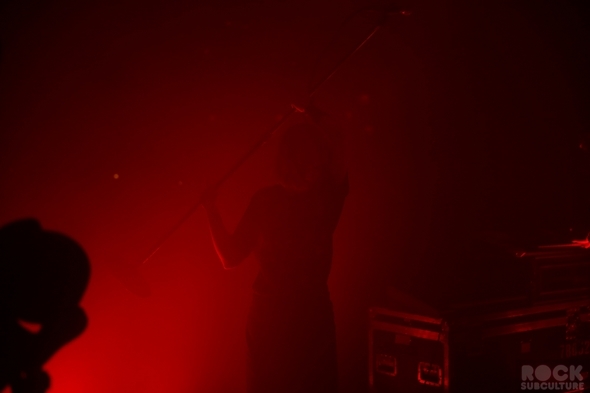 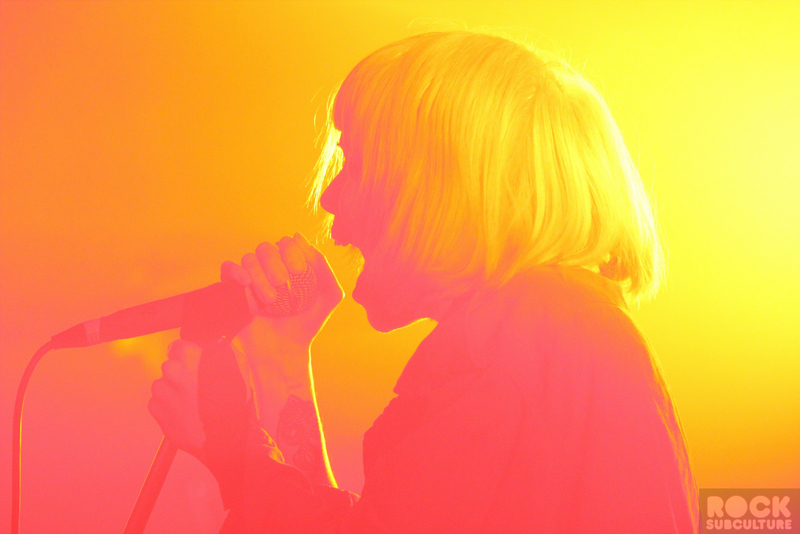 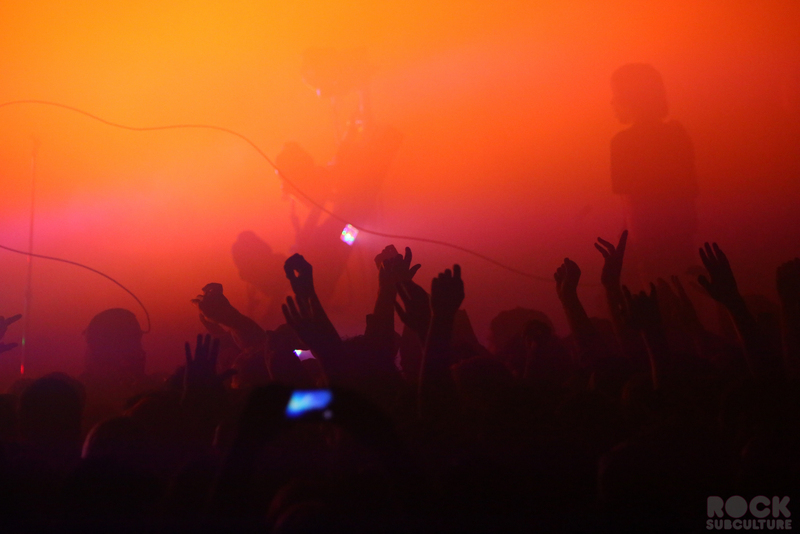 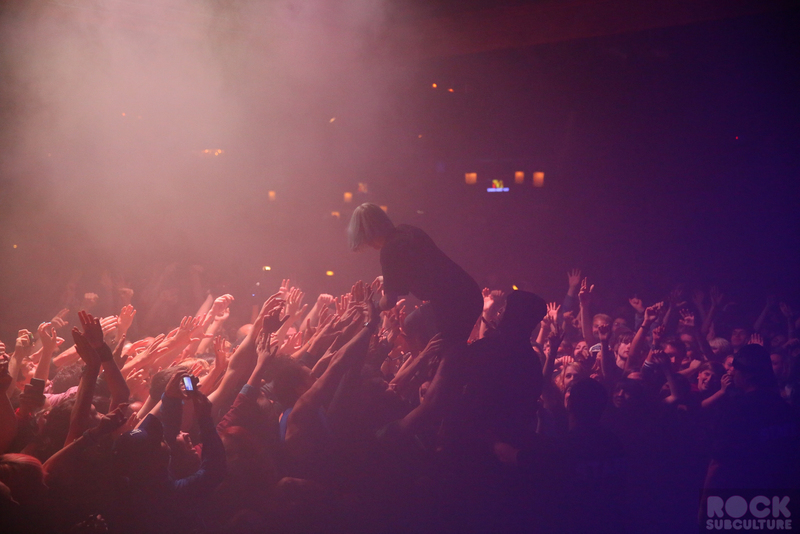 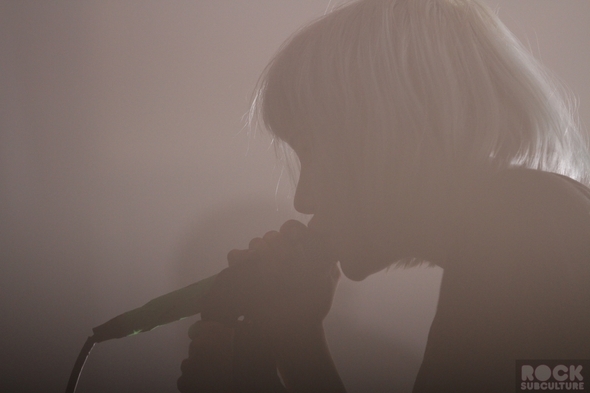 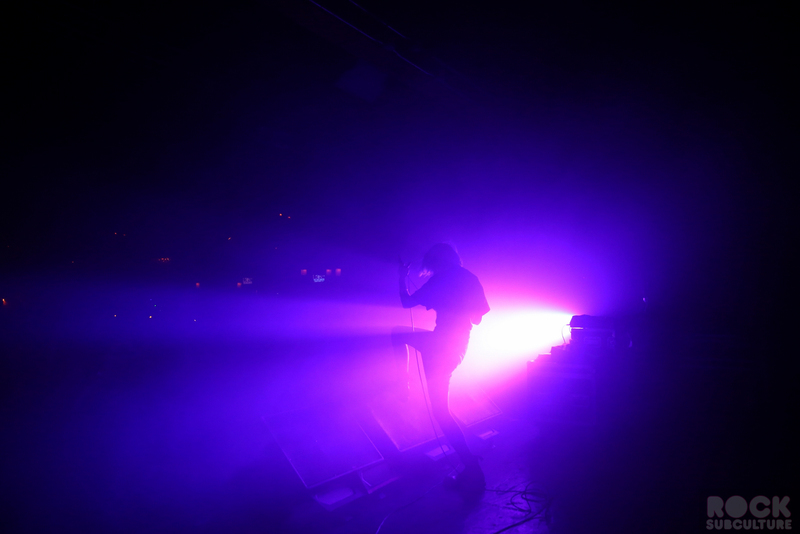 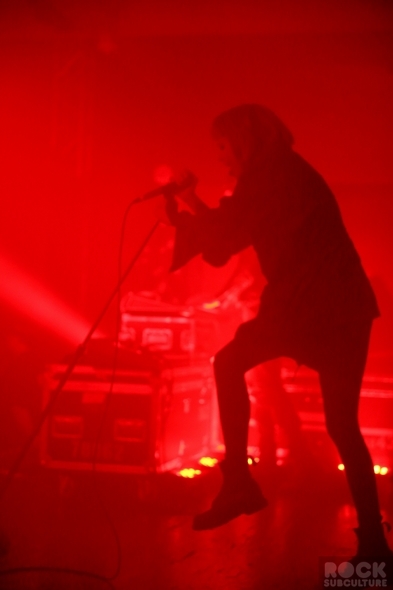 Producer Ethan Kath discovered Alice Glass at the age of 15, when she was singing with punk band Fetus Fatale. 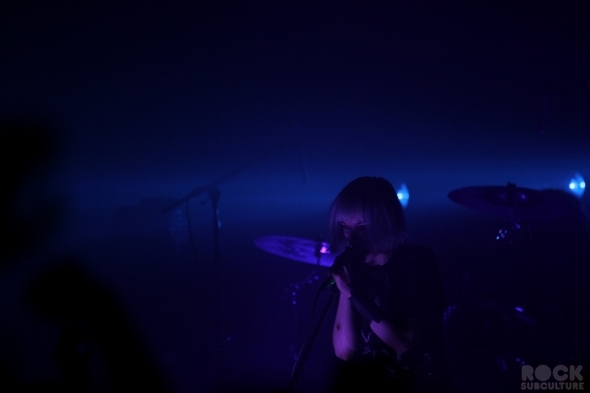 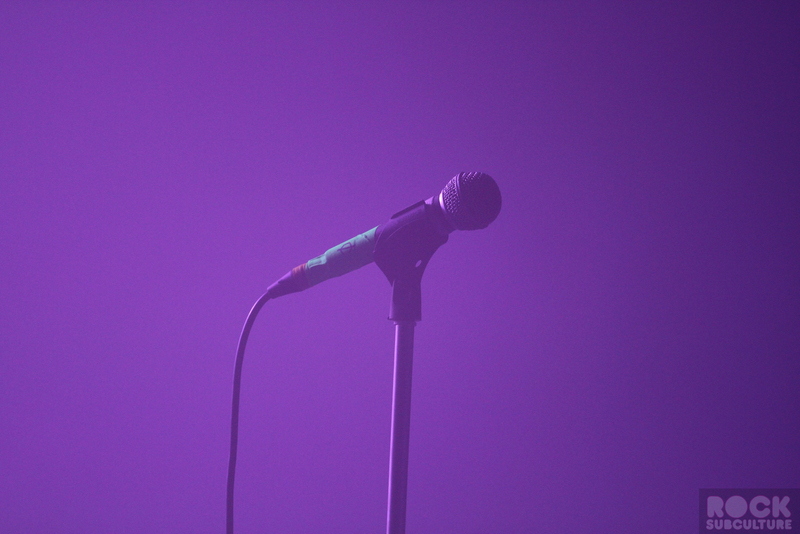 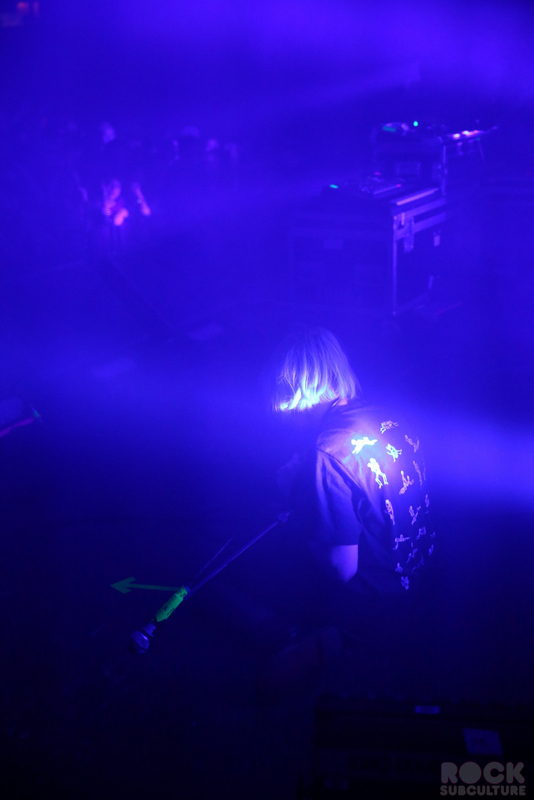 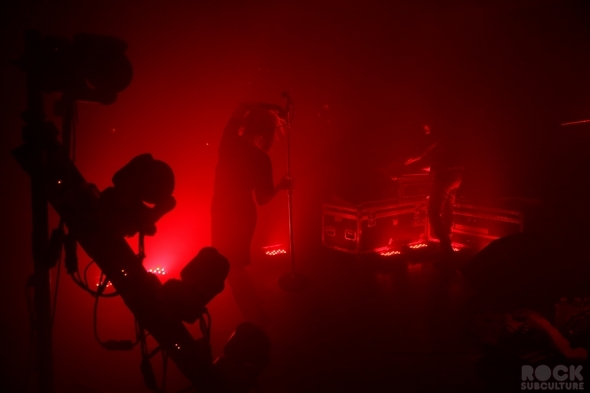 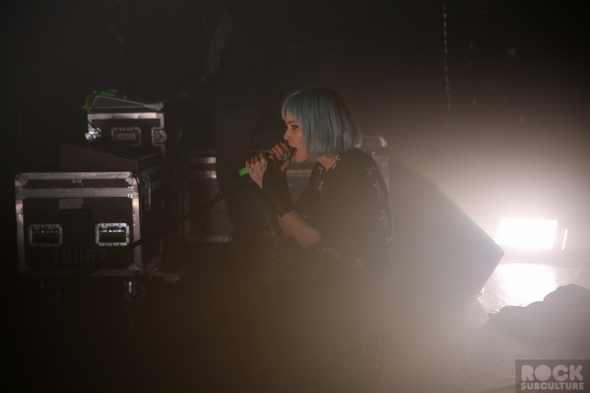 The collaboration began with her writing and recording some lyrics over some tracks he had been working on – the engineer had recorded her soundcheck without her knowledge, and Kath found it and dubbed it “Alice Practice” and put it on the Internet under the name Crystal Castles. 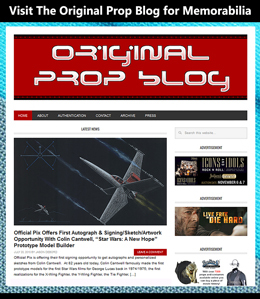 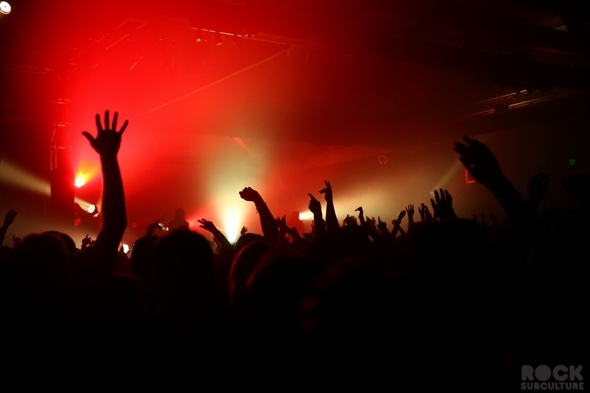 This garnered much interest, and lead to a record deal. 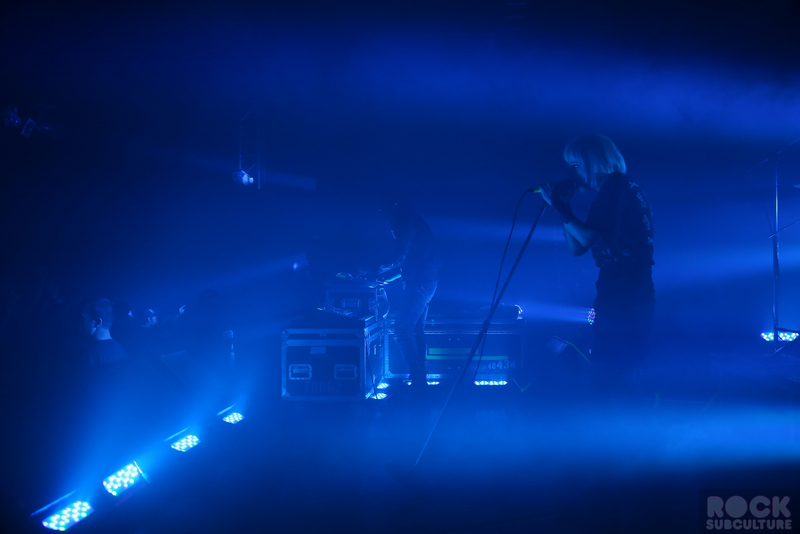 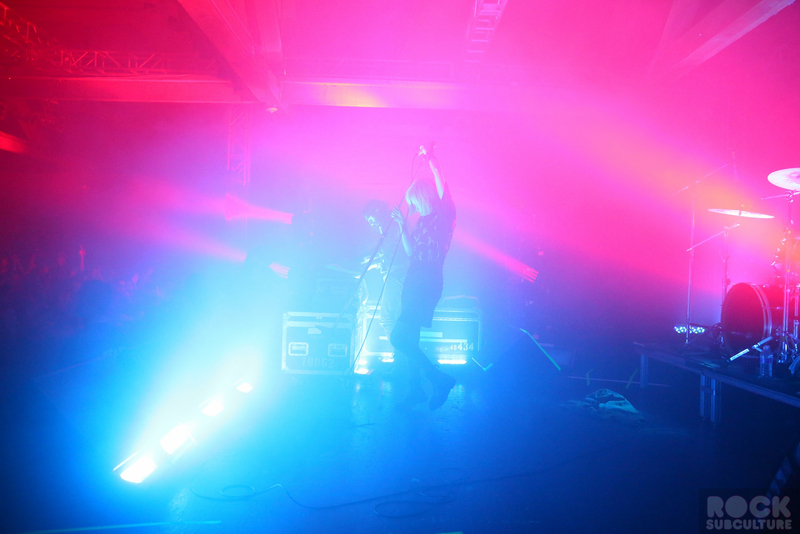 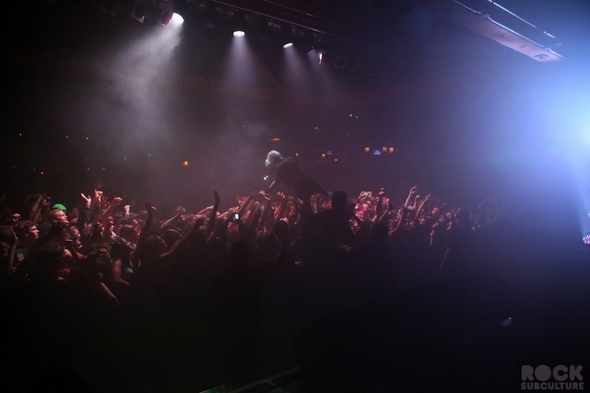 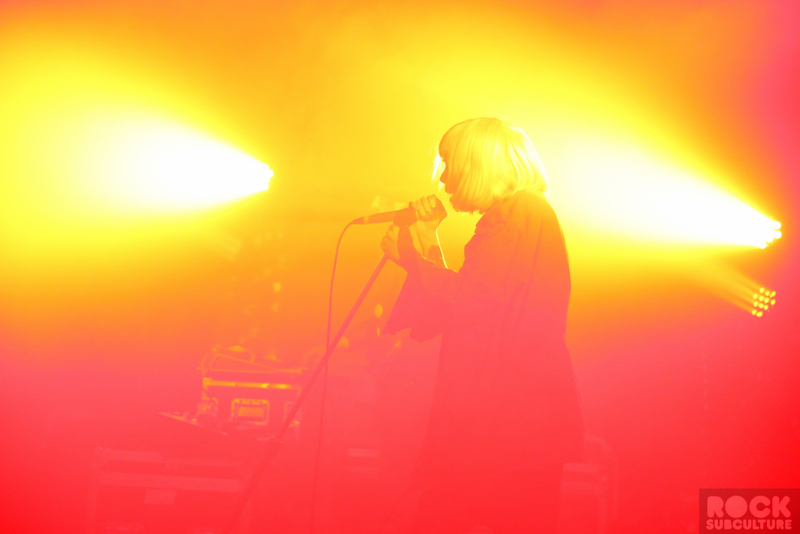 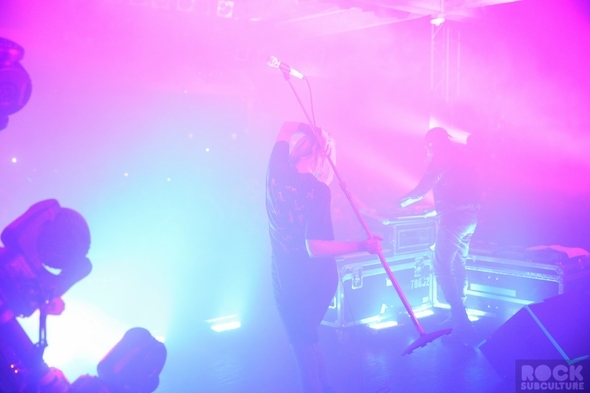 They released their first fill album, Crystal Castles, in 2006, and their second album, (II), in 2010. 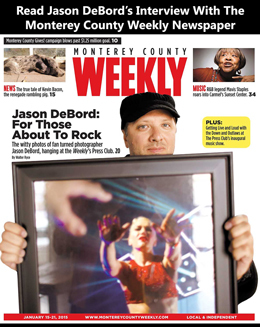 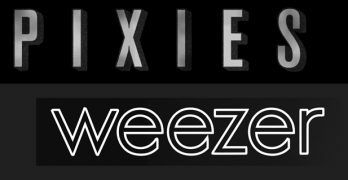 Their latest album, (III), is due for release on November 5th, less than two weeks from the date of this review. 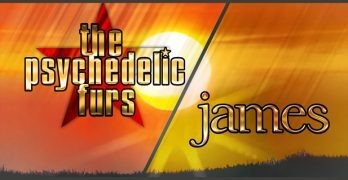 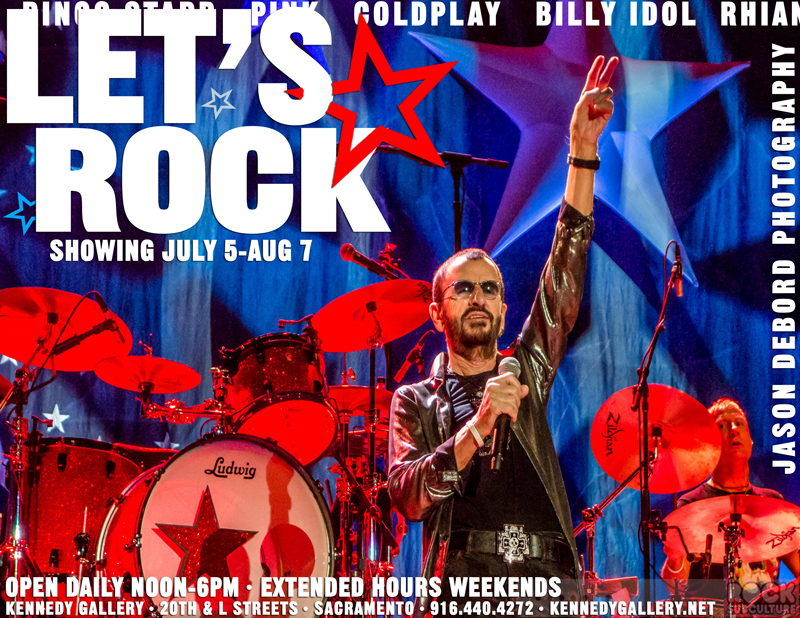 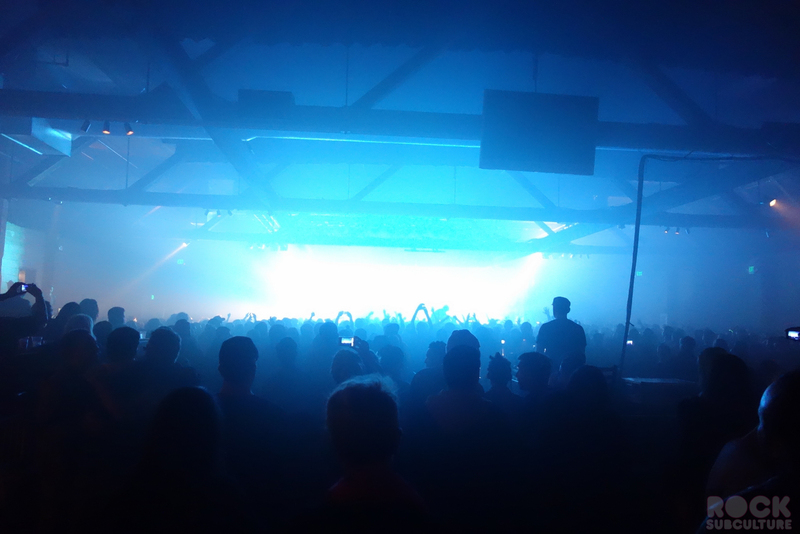 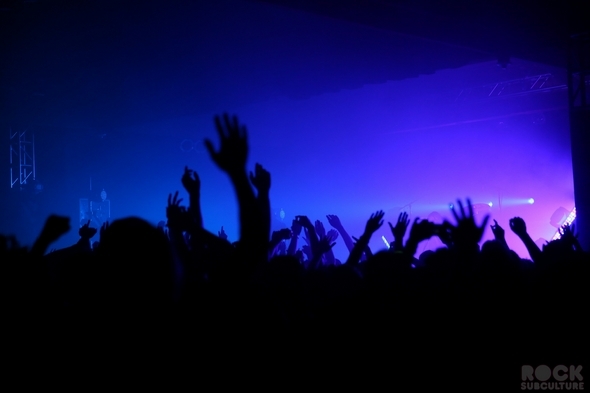 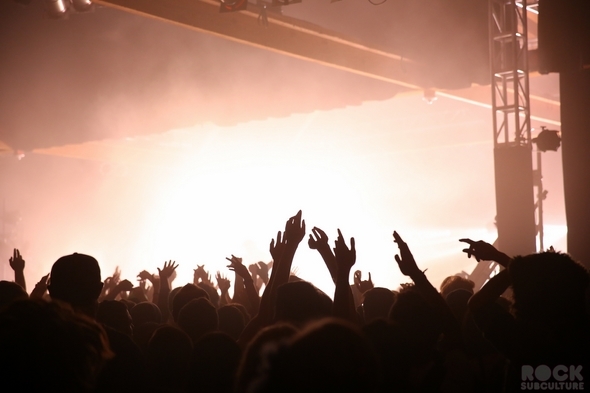 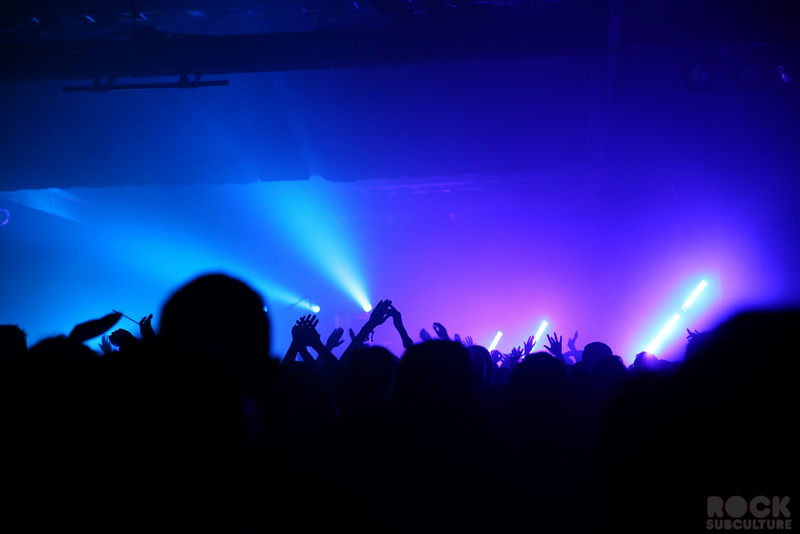 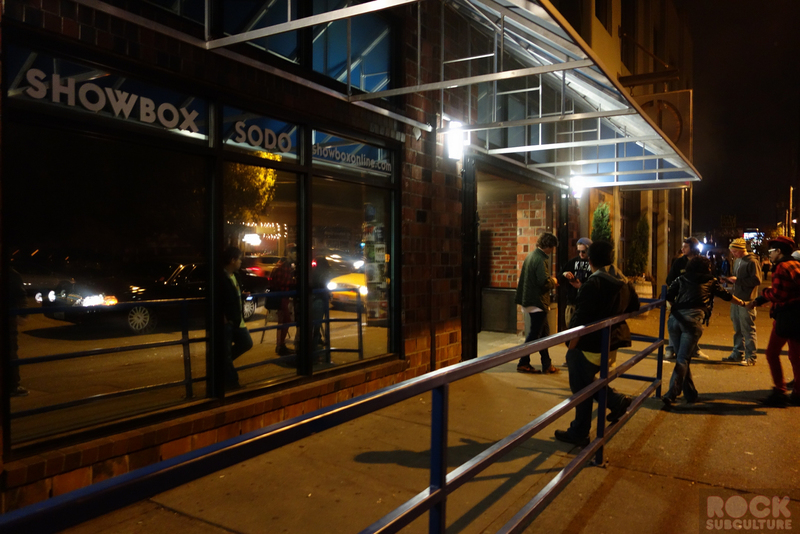 Last night’s concert was my first experience at one of their live shows, and my first thought, arriving on the scene to the sprawling line outside of the venue was that I felt comparatively old. 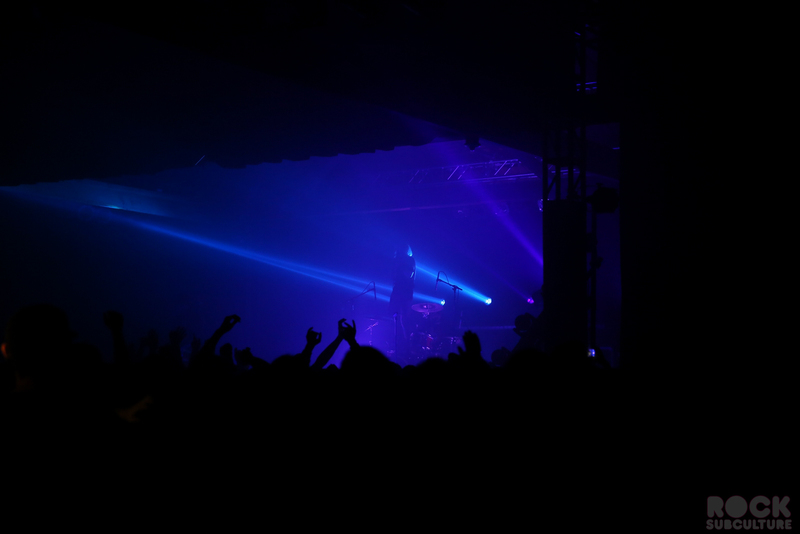 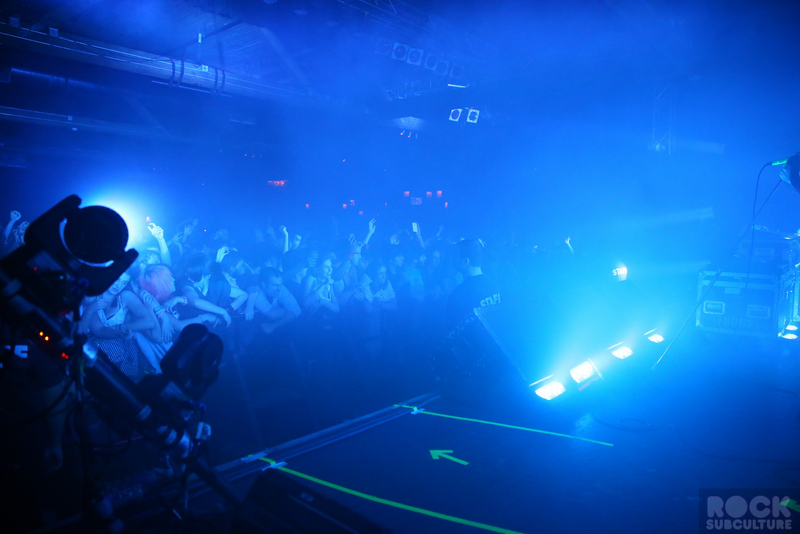 They definitely attract a newer, younger audience with their EDM style sound, and they all seemed quite excited about seeing them live. 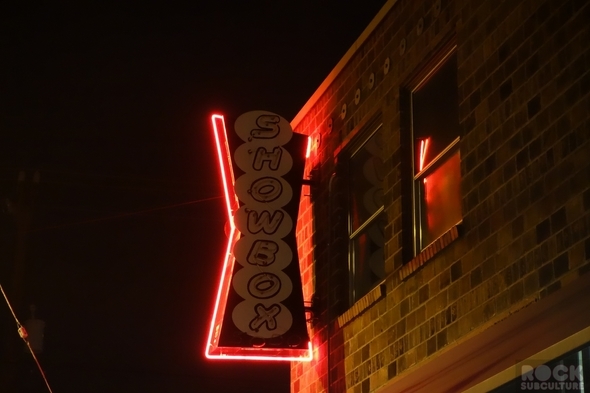 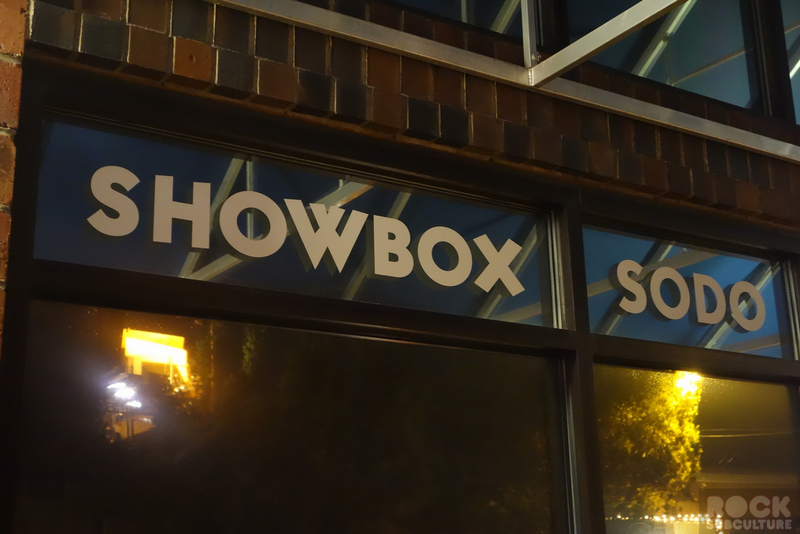 The Showbox SoDo is a pretty cool venue – it is what appears to be converted warehouse space; while utilitarian, the size offers an intimate experience with excellent views of the stage from pretty much anywhere inside, and the sound was quite good as well (loud enough but not overpowering as I find in many similarly sized venues). 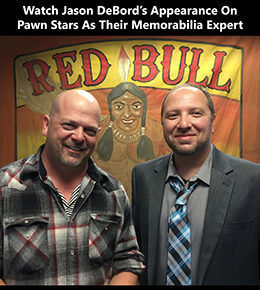 They did a nice job with their interior design, with a modern and clean look, and all of the staff were very organized, friendly, and professional. They put on a really nice event. 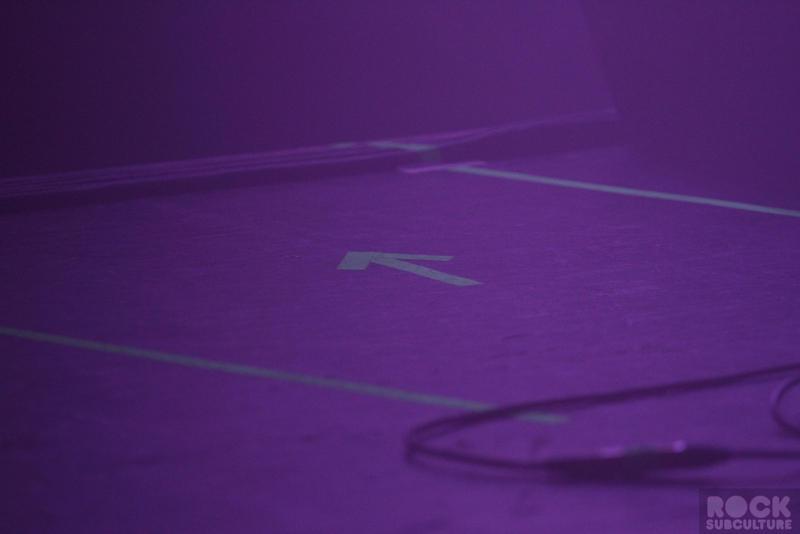 I had a photo pass to shoot the show, and to my surprise, was actually escorted by the band’s tour manager onto the stage, so got to shoot the first three songs essentially from stage left. 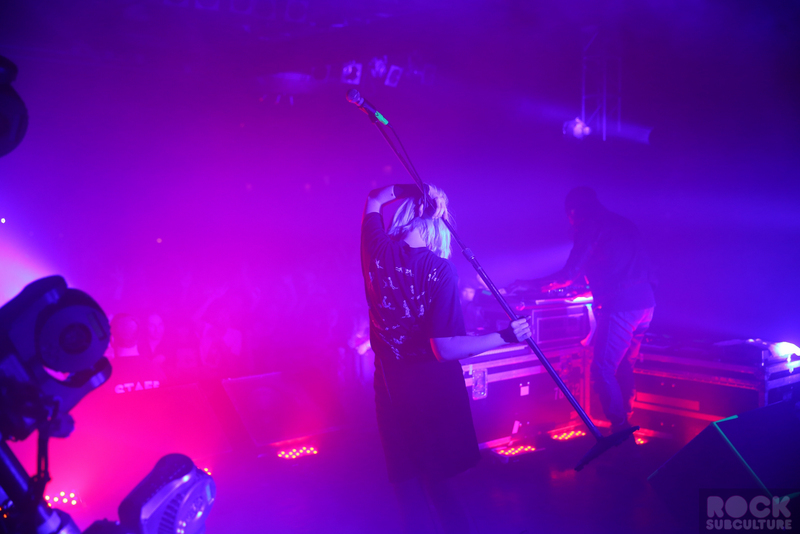 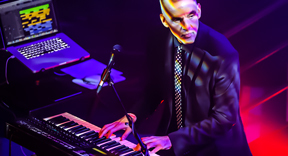 As such, I had an insightful perspective from which to see Alice and the band take to the stage, as well as see front on the audience react and embrace this group with, for some of them, is akin to a cultural phenomenon. 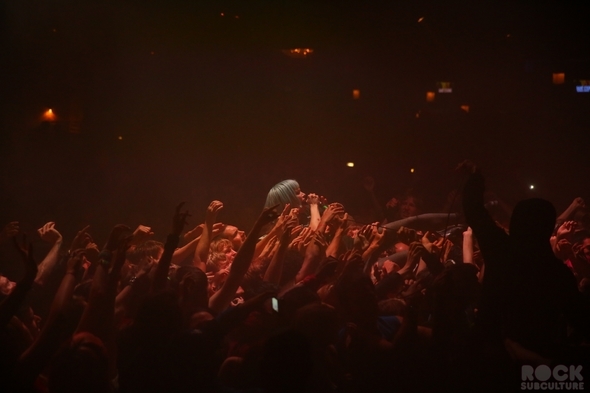 Alice began the set a bit reserved, but as the music pounded and built on its hooks, she really let loose (including with her mic stand, which went flying past me) and as per her reputation, quite quickly ended up jumping into the crowd and surfing over her fans. 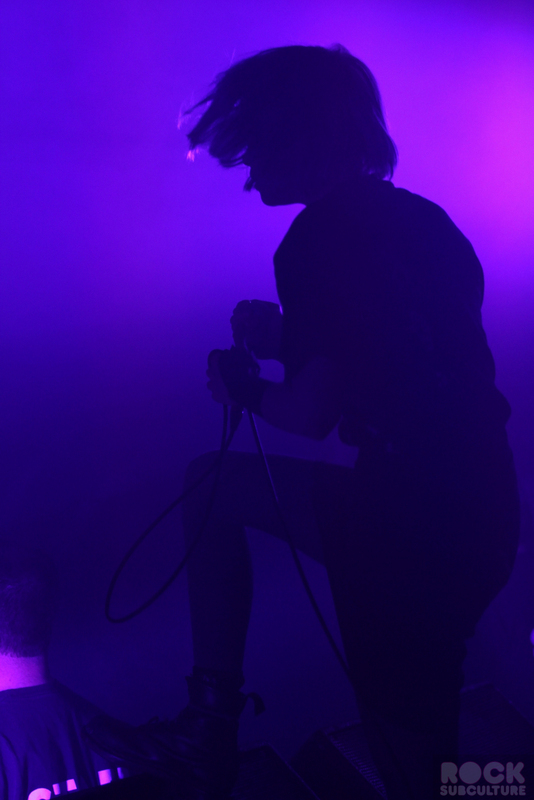 It was an unpredictable and high energy night, and it is interesting to see an electronic-based band with what I would call rock star soul and swagger. They prove that you don’t need an electric guitar on stage to really blow it out (if there was one, I missed it over the intense strobe lighting effects!). I really enjoyed the show and will definitely plan to catch them again in the future.